Each season when you register to participate in winter basketball and our Holiday Tournament, we ask each player and family to read, review and acknowledge that you have completed these items in order to be eligible to play or coach. 2. 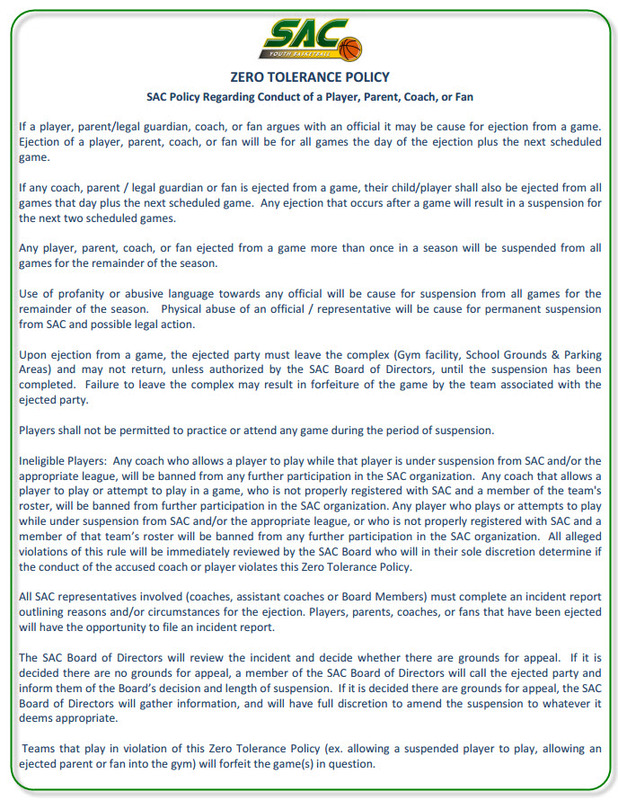 Zero Tolerance Policy - SAC's policy regarding ejections, suspensions and conduct incidents for parents and players. 2. Lindsay's Law - This is a new law that raises awareness of Sudden Cardiac Arrest - the number one killer of student-athletes who appeared to be healthy. Our 3-12-grade Recreational and Select teams are entered to play in league games as part of the Cincinnati Premier Youth Basketball League. Just like SAC, the league has a Liability Waiver and an obligation to be sure that we've communicated both Lindsay's Law as well as Concussion protocols. 1. CPYBL Liability Waiver - Each season you are required to complete the liability form. This is a mandatory requirement and must be completed prior to your child's first game.